The Flash (1990) TV show image via The CW Seed. 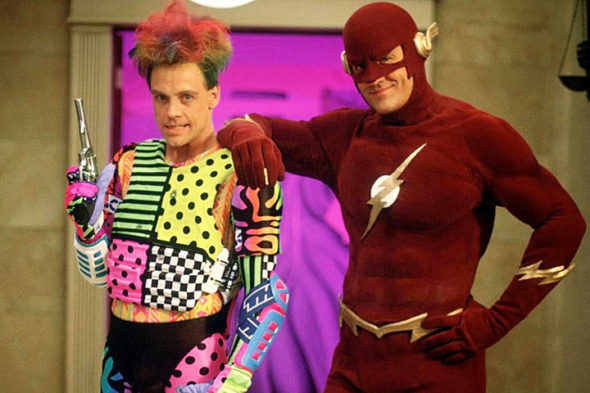 Pictured: Mark Hamill, John Wesley Shipp. News flash! Danny Bilson and Paul De Meo, who developed the 1990 version of The Flash TV show (CBS) will be interviewed on Stu’s Show, hosted by Stu Shostak, Wednesday, June 1, 2016 at 7:00pm ET/4:00pm PT. The duo have also worked together on feature films and video games. Bilson and De Meo began working together at Empire Films, where they wrote the Trancers screenplay. They later wrote The Rocketeer for Disney. Their other TV collaborations include NBC‘s Viper, and UPN’s The Sentinel. John Wesley Shipp starred as the title character in the original Flash TV series and has returned to The CW‘s The Flash, as Henry Allen, and (spoilers) more. What’s Stu’s Show? Excellent question. Stu’s Show is streaming “radio” show. Host Stu Shostak frequently does deep-dive interviews of guests with long lists of TV credits that TV Series Finale readers may enjoy. Stu’s career in television and broadcasting dates back to the early 1970s when he began as an audience coordinator for game shows and sitcoms. In 1982, he received his performing break when he was given an opportunity to do the audience warm-up at the popular situation comedy, “Diff’rent Strokes“. He did so well that he was assigned regular warm-up duties the following season on the Ricky Schroder sitcom, “Silver Spoons“, a position he held for two years. Stu has also done warm-ups for “The Jeffersons“, “Mama’s Family“, “Amen”, and many others. Behind the scenes, he’s been the owner/operator of Shokus Video, a company dedicated to the preservation of 1950s TV shows on DVD and video tape, since 1979. He was also the producer and director of “The Jack La Lanne Show Commemorative Special” home video, as well as Lucille Ball’s personal film archivist for the last ten years of her life. He produced, wrote, and directed a bonus featurette for Shout! Factory’s “Leave it to Beaver – The Complete Series” DVD box set that starred the series’ Ken Osmond and Frank Bank (Eddie and Lumpy), along with supplying a generous amount of vintage archival footage and several “Stu’s Show” interviews for the release. He most recently hosted an on-camera bonus video and co-produced Shout! Factory’s “Dennis the Menace Season One” DVD set. He also worked as a consultant on all three subsequent seasons of the series. “Stu’s Show” continues to attract new audiences each week with its impressive lineup of celebrities in the entertainment industry, both in front of and behind the cameras. What began as a protest toward the current television industry’s continual snubbing of its history, its pioneers, and its heritage has blossomed into a series of over 400 broadcasts preserving classic TV and the people responsible for it. Each 2-hour broadcast contains in-depth discussion of lives, careers, behind-the-scenes memories, as well as recollections of events and programs we all grew up watching! How do you find this treasure trove of behind-the-scenes TV insight and nostalgia? Don’t worry. We have your back. Stu’s Show can be heard live Wednesdays at the Stu’s Show website. If you listen live at the website, it is free. Episodes run at least two hours, but Stu will go longer, when the conversation still has legs. After the live webcast concludes, it is archived on the site. Downloads cost $0.99 per episode. Listeners can download four episodes for the price of three. What do you think? Are you a fan of the 1990 version of The Flash TV series? Do you think you’ll check out Stu’s Show and listen to Bilson and De Meo reflect on The Flash and their other past works? Are you already a Stu’s Show fan? Tell us.